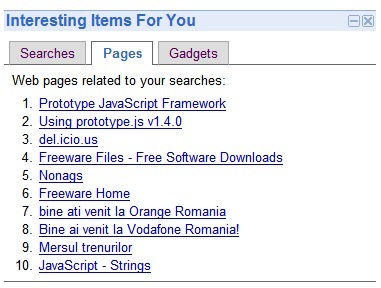 The module called "Interesting things for you" features searches, web pages, and gadgets. The searches were previously available in Search History Trends and included the top gaining queries related to your searches. So the recommended items have two qualities: they are popular and related to your searches. 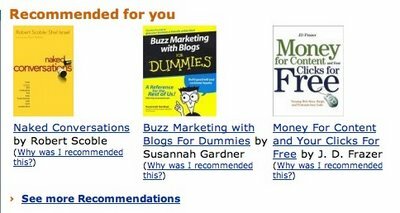 This reminded me of Amazon recommendations and the power of personalized recommendations. Of course, in this case, Google doesn't want to sell anything. It just wants to use the information from your profile for interesting things, and I'm sure there are more things to come in this area. After "Suggested Google Groups", "Recommended Google News", this is another recommendation system that uses implicit data collection (no work from the user). Definetly adding this, its like Stumble Upon for personalized homepage, but based on your interests. pretty damn cool, haven't tried it out yet but there is some great potential here. But I do seem some problems, such as ad-based sponsorship of these results - which would seem more of a privacy concern. Hmmmm interesting! As mentioned above it reminds me of StumbleUpon. But on the other hand I don't think I will consider that service as a giant leap towards privacy. You shouldn't think that your profile isn't used for commercial purposes. I like it.....but does anyone know actually how this works...like for example, sure I use myspace, I listen to a wide variety of music, and I live in Florida...so a lot of my "recommendations" via the "stumbleupon-alike" button in my toolbar seem to turn up lots of "myspace customization" sites, some bands and record labels here and there, and then on ocassion some PC-help sites (trouble shooting, some of them which relate to spyware and such processes). Now...Ive used stumbleupon in the past, I think Google needs an "i dont like this" button.....I mean, Ive been using the google bookmarks service as an "I like it"...but with these "stumbled" pages being recorded into my google History, they would be affected my FUTURE recommendations, even if I didnt really care for the particular recommendation. This feature is SO AWESOME. I love it. Most of the suggestions make sense...I'm a web developer, so many of the suggestions involve php or actionscript 3, but usually about 2/10 of the suggestions are completely random (and a lot of the time very funny). The links seems to be updated at least daily, giving me yet another thing to look forward to. I heart Google. When u tytpe in babies it comes up with 1 pic that says defenceless babie and it a mushed up babie plz take it of. Unfortunately, the service has been discontinued.